UFC 214 Primer: Can Demian Maia Finally Become Champ? The post UFC 214 Primer: Can Demian Maia Finally Become Champ? appeared first on Caged Insider. Bellator 181 comes to WinStar World Casino and Resort in Thackerville, Okla., this Friday night (July 14, 2017) as Brandon Girtz and Derek Campos look to settle their score with a trilogy fight in the night’s Spike TV-televised main event after splitting two previous encounters over the last four years. Earlier in the night, though, an important Bellator debut is taking place. A slew of female Flyweight fighters came to Bellator MMA in April, with Valerie Letourneau being perhaps the most instantly recognizable name. Many will remember that she challenged Joanna Jędrzejczyk for the Strawweight title at UFC 193, taking “Joanna Champion” to the limit in a five-round decision loss. Now, Letourneau gets to rebrand herself at a more natural weight of 125 pounds, but the 8-6 fighter doesn’t get an easy debut against Emily Ducote (5-2), who is fresh off a rear-naked choke of Katy Collins at Bellator 174 earlier this year. MMAmania.com recently spoke with Letourneau about the “Trouble” she plans to give all of her opponents in Bellator now that she gets to fight in a weight class better suited to her. If that strikes you as odd given Letourneau is not that old at 34, she’ll tell you that it’s hard for anybody to cut, but twice as much so for a woman. That’s in addition to the already large physical toll a fight camp takes on the human body. Letourneau’s philosophy is simple — why kill yourself twice? In addition, Letourneau believes UFC should have had a 125-pound division for women long before it was announced for The Ultimate Fighter. Will it be as smart to start Letourneau against a tough fighter like Ducote? The more you hype up a debut, the bigger the chance it can backfire. Letourneau is scouting Ducote to avoid a letdown. There was no way Letourneau would have turned down a fight with anyone in the Flyweight division, though, whether she knew their reputation in advance or not. 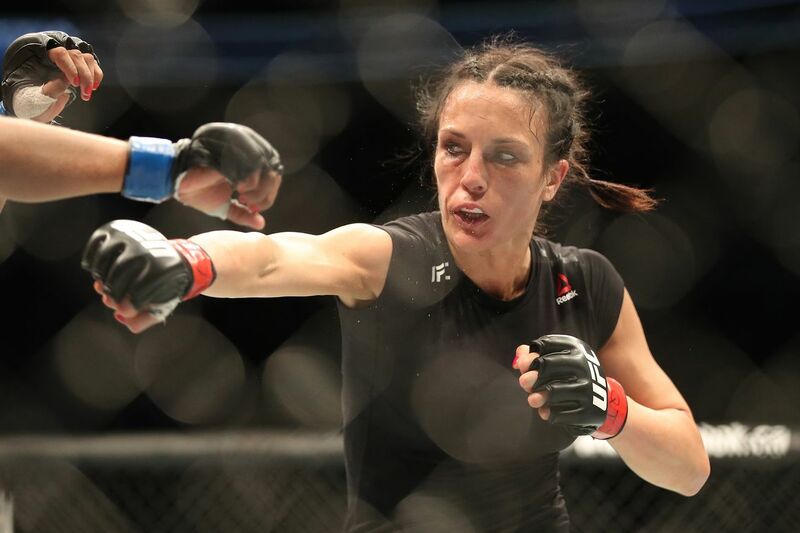 The most important thing for Letourneau is that she’s able to fight and train in a healthier way now, which she believes will combine to create a vastly superior performance. So how soon should an improved Letourneau fight to be the uncrowned Bellator Flyweight champion? In her opinion, pick anybody new who fights well and make it happen … or perhaps give her a fight with Macfarlane. The bottom line for Emily Ducote and the Flyweight division on July 14 is that “Trouble” is coming her way … sooner than later. Complete audio of our interview is embedded above, and complete coverage of “Girtz vs. Campos 3” resides here at MMA Mania all week long. Demetrious Johnson has had enough. On the cusp of making history, the UFC flyweight champion, who is one title defense away from becoming the most successful champion in UFC history, has provided MMA Fighting with an exclusive statement (below) about his current relationship with the UFC. Over the past month, the UFC has attempted to book Johnson in a title fight versus bantamweight contender TJ Dillashaw, however, Johnson has resisted that idea. In the statement, which you can read in its entirety below, Johnson, who’ll be a guest on Monday’s episode of The MMA Hour, explains why and lays out, in great detail, other issues he’s had with UFC management as of late. He also responds to UFC president Dana White, who recently said it was “insanity” that Johnson was in favor of fighting top flyweight contender Ray Borg over Dillashaw. For years I have been a company man and kept quiet, accepting fights, doing as they asked, and always remaining humble and grateful for the opportunities provided to me through mixed martial arts. This is how I was raised through the sport. Unfortunately, UFC’s mistreatment and bullying has finally forced me to speak out. I’ve decided to speak out now as I feel like my values and character as a person and a fighter are being tarnished by an organization I’ve done nothing but sweat and bleed for over the last seven years of my life. If it takes me speaking up and encouraging other fighters to ban together to start getting fair treatment, then so be it. UFC Matchmaker Mick Maynard called and offered the fight vs. Ray Borg. I thought [Sergio] Pettis was a more marketable name and on a longer winning streak. Mick went back to Dana, then came back and told us that I had no choice, it was going to be Ray Borg, not Pettis, and there were no other options. That was the command from Dana and company. This would mean that my only chance at PPV points at flyweight was vs. Ray Borg. I said OK, but it’s not fair to make that my only chance at PPV points, when Cody Garbrandt is saying he wants to come down and fight me at flyweight, which was the fight I wanted. We told Mick that to be fair we would take the fight, but [we] want PPV points for future fights at flyweight. Mick agreed and said it was fair and didn’t see any problem with that situation. Mick spoke to Dana and [UFC matchmaker] Sean Shelby, who then told him to deny giving me any future PPV points for all of my future flyweight fights. Further, I still had to fight Ray Borg and they were giving me no other choice. I accepted the fight with Ray and decided to deal with the unfair situation and despicable treatment by Dana and Sean after I succeed in breaking the consecutive title fight defense record in my next fight vs. Borg. Mick thanked me for accepting the fight, knowing that I was being screwed over and mistreated by Dana and Sean. I wanted a reason for not being allowed any future PPV points. Sean Shelby called and told us how smaller fighters don’t sell, that UFC can’t make stars of anyone, and that a fight between Cody and I wouldn’t be a sellable fight. We disagreed. I think a fight between Cody and I would be popular if it was even given a small serving of the marketing efforts put into other big fights. UFC has failed to market and promote me appropriately. Prior to my last fight, where I tied the record for the most consecutive successful title defenses, we waited to re-post UFC’s social media posts about me from their Facebook page. There weren’t any posts until a few days into fight week, then, there were a total of two posts. In comparison to others who they promote across their social media platforms, they failed to do their job in promoting me and that monumental event. In my recent conversations, Sean and Dana have confirmed UFC’s lack of desire to put any effort into promoting us. In addition to the above, I want to address the lack of marketing and promotion of the flyweight division, even though Dana will claim otherwise. I would challenge that the UFC doesn’t even market the division. It’s been three years since the UFC launched three new divisions in two years (2012 to 2014) where they focused most of their marketing efforts to grow female mixed martial arts, which I understand. But, we are now three years post-launch, and the company continues to do the bare minimum in marketing the division well past the launch of these other divisions. As a fighter, I pay very close attention to the amount of marketing that goes into and around my fights and I can tell you that you’d be hard pressed to find much that has been done to promote me outside of TUF 24, which was minimal in comparison to other fights, fighters and shows. With me, the UFC chooses not to market the best fighter in the world and arguably the greatest fighter of all time. I can’t think of any other sports organization in the world that has the best player in the sport where the league, or the organization, doesn’t market that player to their loyal fan base to sell more of their product. Look at my track record for showing up to fights. Look at my track record of finishing fights. Look at my track record of getting fight night bonuses. Ask yourself if you think that if the UFC decided to truly put marketing dollars behind me that they couldn’t sell me or my fights. Completely unrelated — and after the accepted fight vs. Ray Borg — Cody Garbradt injured his back and TJ Dillashaw said he wanted to fight me. Dana told me he wanted me to fight TJ, which I disagreed with for multiple reasons. First, TJ has never fought at flyweight and is unlikely to make the weight, which would then eliminate the possibility of breaking the title defense record. Second, they have already told me that a fight between Cody and I wouldn’t be sellable, so fighting TJ would have no monetary upside. Third, TJ is not a flyweight or a current champion in another weight class and was KO’ed by the flyweight whom I beat twice already. Last, Ray Borg and I already agreed to the fight, which UFC tyrannically demanded, while denying me any future PPV points. After telling Dana my reasons, Dana angrily told me that I am fighting TJ, once again, with no other option or say in my career, and against the plans we had previously laid out. He went on further to say that if I didn’t take the fight against TJ, and drop Borg as the opponent, he would get rid of the entire flyweight division. He said, this is for TJ and I’m taking away TJ’s opportunity. That fact that he feels that what I should do in my career is for TJ, tells where his priority lies. Sorry Dana, my career is about Demetrious Johnson and my goals of fighting the best current flyweights, breaking the record of title defenses, going after the bantamweight champion after I have broken the record, and making money for my family. My career is not about doing for Dana’s buddy, who is neither a bantamweight champion or flyweight contender. We ended by disagreeing and left it there. The next day, Dana went to the media and announced that I was fighting TJ Dillashaw, in an obvious attempt to bully me in the media and tarnish my reputation. I posted a short statement letting people know that I had not agreed to the TJ fight, but had already agreed to fight Ray Borg, as demanded by UFC. Dana put up an interview stating that it was “insane” that I didn’t want to fight TJ, that “he makes the matches and that is the match he is making,” and, “You tell me why DJ doesn’t want to fight TJ,” trying to make it as though I am scared or ducking TJ Dillashaw. Mick spoke to me to try to change the offer from Ray to TJ. I told Mick that I thought TJ should fight once in the division first, prove he can make the weight and get a win at that weight, then fight me if I wasn’t already busy with Cody. Mick agreed that it made the most sense. Later Mick called again, as mandated by Dana, to try to make the fight with TJ and drop Ray. We told him that we didn’t think TJ would make the weight and the fight would be off since it would no longer be a title fight without TJ making weight. Mick said they guaranteed that TJ would make weight. We told him that since it was guaranteed by TJ and UFC was demanding and putting me in a bad circumstance, then it is fair that if TJ didn’t make weight, the fight would be off and I would still get my guarantee, plus TJ’s guaranteed pay. Mick said that Ray would be on the card and he could fill in if TJ didn’t make weight. We said, oh, then which one do I train for? I thought TJ guaranteed he was making weight. Is it a world championship with the No. 1 pound-for-pound fighter on earth, or an amateur tournament where I don’t know who I’m fighting until I get there. Obviously there was no guarantee and they just wanted to push me to do something that they knew wasn’t a good choice for my career. The “guarantees” that they made had nothing to back them up and they were unwilling to give a real guarantee to compensate me for all the damage I put on my body preparing for a fight that may not happen. The fact that they said Ray will be a backup shows the lack of respect they have for what we go through in preparing for a fight at this level. Mick went back to Dana and Sean, then came back and told us that they don’t agree with my request and I have to fight TJ with no guarantee to make weight or financial incentive if he doesn’t make weight. This is typical of the unfulfilled promises and bullying that has gone on through my UFC career. I agreed to their tyrannical demand to fight Ray Borg and Ray also agreed. UFC has refused to give me PPV points on any future flyweight bouts, and has never given me any PPV points on previous bouts. My request was fair and the matchmaker in charge of the flyweight and bantamweight division agreed. I gave UFC fair conditions to change the fight to TJ Dillashaw and they refused. Dana and Sean have told me that they have no interest in marketing me or the smaller divisions, so when they say that I will make PPV money vs. Dillashaw, they leave out the fact that I have to hit certain numbers of buys, which will not be hit if they fail in marketing me like they have in my previous fights. If TJ doesn’t make weight, I can’t break the record for the most consecutive title defenses and they have denied paying me in that circumstance. Dana has made an effort to bully me in the media as well as in private, in order to get what he wants, even though it is not what is best for me or the sport. If Dana says this will be a big PPV fight for me, and that they will promote it properly, then he can pay for it up front and explain to Ray Borg why he is being taken out of the fight that the UFC matchmaker in charge of the division put him in. Otherwise, it is just another lie and attempt to bully me to do something that Dana wants, but is not the right thing to do for the sport or my career. UFC’s track record in making an effort to promote my fights, and Dana’s claim that this is a big chance for PPV dollars for me tells a different story than what Dana is stating to the public. RIO DE JANEIRO, Brazil — Paulo Filho was on the top of the world. Unbeaten in mixed martial arts fights, the Rio de Janeiro native dominated everyone he faced inside the PRIDE ring, cementing himself among the best 185-pound fighters on the planet after winning 13 straight bouts until 2006. Unfortunately, the memories of Filho shining inside a ring began fading away a long time ago. Since PRIDE collapsed, Filho has racked up a modest 9-6-3 record competing at ports across the globe, never coming close to duplicating those glorious days in Japan. It’s been a hard stretch. Now a decade removed from his heyday, Filho has decided to open up, and — in his own words — help others who are battling drug addiction. Filho’s issues began the very first time he fought in Japan, back in 2001. The jiu-jitsu ace used the supplement Ripped Fuel, which contained ephedrine, and his usage was way over the normal amount. It got worse. At one point, Filho — who was having a hard time sleeping — was taking three pills a day. That’s when he was presented with the “solution,” a drug called Rohypnol. Unlike some of the top fighters around him at Brazilian Top Team at that time, Filho wasn’t into training during the day. Living in Niteroi some miles away from the gym, he began to train his own way. At first there wasn’t a drop off. He was still winning fights, despite his unorthodox training method, but he was quietly damaging his own health. Away from his parents, who lived in Copacabana, Filho was surrounded by new “friends.” He didn’t realize it back then, but that also contributed to his downfall. When PRIDE collapsed in 2007, Filho signed with WEC. His teammate Anderson Silva, who was managed by Jorge Guimaraes and Ed Soares — the same duo that managed his career back then — was already the middleweight champion in the UFC. Filho gave himself a mission to work his way up, and one day hold the belt inside the blue cage. It didn’t take long for Filho to reach the top of the division. He was matched up against 48-fight veteran Joe Doerksen for middleweight gold right out of the gate, in his WEC debut, and won by first-round TKO. Four months later, Filho was set to defend his belt against Chael Sonnen, but — little did everyone know at the time — he wasn’t the same fighter anymore. That’s when he dabbled in cocaine. As the common refrain goes, the euphoria he experienced during his first use made him want to try it again. And again. And again. Filho says he was never truly addicted to cocaine, but using it all the time — combined with his use of Rohypnol and Ripped Fuel — plagued his health. And when he was “hit” by a recurrence of depression, he went down for good. “[Depression] is complicated because it is considered a rich people’s disease, but it drags you down,” he says. “So you try to find ways to beat this disease, medicine, drugs, alcohol. People with depression will do anything to get out of this misery, and cocaine turns you into a slave. Cocaine slowly brings you down, and it’s so dangerous. Filho defended his WEC belt for the first time with a second-round armbar against Sonnen, but the “carioca” fighter was already losing a battle with his demons outside the cage. Even though he was already using cocaine, and didn’t have a proper training camp for WEC 31, Filho was confident he had what it took to defeat a veteran like Sonnen. Filho’s poor performance, and Sonnen’s complaints that he never tapped, led to a rematch. Sonnen, who beat Bryan Baker three months later, returned to the cage later in 2008 to rematch the middleweight champion in one of the strangest fights in the history of the sport. Filho, who at one point weighed almost 245 pounds leading up to the fight, spent a whole day in the sauna in a desperate attempt to cut every ounce he could. All the effort wasn’t enough, and he missed weight by four pounds. WEC turned the five-round championship contest into a 15-minute bout, and Filho’s 185-pound title was no longer on the table. When the referee started the contest, Filho was unrecognizable. “I don’t regret fighting [at WEC 36] because ultimately it was my fault,” Filho says. “If it was my fault, I was the one who had to deal with the consequences. And I paid for it, with everything I had. The way I did, I think it was kind of noble. I didn’t hide behind my problems. Instead, I faced them. The one that worked hardest would deserve the win, and that was Sonnen. He deserved more than anyone to win that fight. Filho admits he deserved that stretch of hell. For Filho, it was his first lost in an MMA fight for the first time, and he was fined a percentage of his purse. From a big picture sense, it wasn’t all bad because he still left the cage with the WEC belt. However, he didn’t feel like a champion anymore. “When the fight was over, and I lost the decision, I went to the hospital and stayed there for a while,” he says. “When I woke up and looked at the belt, I said, ‘this belt doesn’t belong to me anymore.’ I called Ed Soares, who was my manager alongside ‘Joinha’ back then. Sonnen’s father had just passed away and his dream was to see his son win a belt, and I felt it was fair to give it to him. Filho hit rock bottom, though, losing for the first time and being released by WEC. All of that still wasn’t enough to wake him up from the madness that had become his daily life. It didn’t take long for Filho to return to action, as he next faced Melvin Manhoef in DREAM. After an early scare, the fighter — who once again arrived overweight to Japan, but this time managed to hit the 185-pound mark — scored an impressive submission. Filho was still battling issues outside the sport, though. One thing he thought about frequently was ending his own life. Less than two months after submitting Manhoef, Filho was announced at the historical Bitetti Combat 4 and was matched up against Alex Schoenauer. Competing alongside popular names like Ricardo Arona, Murilo Rua and Pedro Rizzo, Filho appeared to be in rough shape at the weigh-ins, and only managed to show up at the gymnasium a few hours before the fight. He was wasted on cocaine, but somehow fought to a decision victory. Filho wouldn’t listen to his parents, who desperately asked him to move away from Niteroi and start living in Rio de Janeiro to train at Team Nogueira, or — short of that — move to the United States for a fresh start. He didn’t take the advice. Years later, Filho admits that living away from a gym was one of the biggest mistakes he has made in his life. “Living in Niteroi pushed me away from everything,” he says. “You get used to this life. [Beaches like] Itacoatiara, Camboinhas. You get lazy. You don’t train so hard. Your opponent is there, working hard to accomplish something, and you just want to live your life. Filho was taking one fight after another in Brazil and overseas, and he clearly wasn’t taking anything seriously. In the midst of the chaos going on, his father passed away. There was no one around to prevent him from signing those contracts. Another thing that turned him away from training was his obsession with pitbulls. Filho opened his own kennel, and still is in love with the dogs there to this day, but admits that — especially at the time — it became an added distraction. “I’m not the kind of person who does many things at the same time,” he says. “When I do something, I’m all in. When I shifted my focus to dogs, going to the beach with my friends, I lost focus. And when I lose focus, it’s for good. But I never stopped fulfilling my obligations with fighting, even if you could see that it wasn’t working out. The World Series of Fighting signed Filho in its early days. His run with the promotion lasted only one bout — a decision loss to Dave Branch — and was full of controversy. Back in Brazil, Filho continued to insist he was fine. Five months after losing to Branch, he fought to a draw with Rodney Wallace. It should have been a decision loss, but the rules for that particular contest dictated that a fighter could only win if he finished his opponent. Filho added another loss to his resume a few months later, but kept moving on. In September 2014, Filho was announced as the main event of Fatality Arena 7 in Sao Goncalo, Rio de Janeiro, against UFC veteran and Nova Uniao fighter Amilcar Alves. A few bouts into the event, the promotion revealed suddenly that Filho would not be competing. At the time, Filho said he refused to fight because the promoters wouldn’t pay him what they had agreed to previously, yet the local commission said Filho had passed out. There was much confusion. The truth is, Filho suffered a panic attack. “One hour before the event, I got information that messed with my head and I was in a state where I couldn’t compete anymore,” Filho says. “It was a misunderstanding. I received information that was unfair, but that gave me a panic attack, to the point that I couldn’t even move. A couple of months later, Filho found himself in the headlines again. This time, the MMA veteran was shot in the leg at a party in Joa, a fancy neighborhood in Rio de Janeiro. The bullet that hit Filho ended up breaking his femur, and he underwent emergency surgery at a local hospital. “The head of security shot me,” says Filho, admitting guilt for his part in the altercation, but arguing that shooting him wasn’t necessary. “I had an argument with his son because he didn’t let me get inside the party, and I ended up pushing his face. His father didn’t say a word, just pulled the gun and fired. Filho, who was so close to dying many times before — like the three car accidents he been in, all of which can be attributed to his drug use — didn’t think he was in danger of dying this time. Finally clean and with his demons in the rear-view mirror, Filho won’t yet commit to fighting professionally again. The 38-year-old jiu-jitsu black belt moved back to Copacabana to live with his mother and is training jiu-jitsu at the Carlson Gracie gym. His focus these days is sharing his story with those who battle drug addiction, and to share his grappling knowledge with the young generation. That itch never goes away, though, and Filho won’t officially close the door on a return. In fact, there’s optimism in his voice that he just might. “I’ve done several interviews in the past and said I wasn’t using [cocaine] anymore, but I wasn’t well,” he says. “I find myself teaching. If one day I come back to fighting … winning and losing is part of it. I have no plans of being what I used to be again, but I still have that desire of stepping inside the cage one more time. Maybe two or three times more. Who knows? Test myself, at this level I am now. If that’s what I decide to do. Filho says hunger is the key. If his drive and hunger are there, he’s not worried about how many years he took off his life, or trying to return to old glories. The post Amanda Nunes Finally Shows Ronda Rousey Some Respect appeared first on Caged Insider. The post Michael Bisping Finally Gets His Title Shot appeared first on Caged Insider.